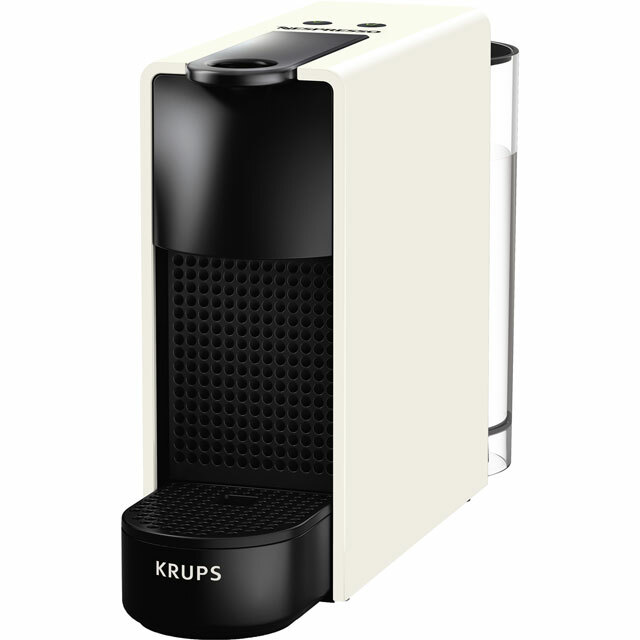 Enjoy luxurious, flavoursome coffee with this white Nespresso® Essenza machine by Krups. It works with the full range of Nespresso® coffee capsules, so you can experience a range of delicious blends. It has a heat up time of just 30 seconds and an automatic shut off feature, which turns itself off after 9 minutes of inactivity, so you’ll never have to worry about accidentally leaving it on or wait too long for it to heat up again. Whether you prefer a short espresso or longer lungo coffee, you can prepare both at the touch of a button thanks to the programmable coffee size feature. Register your machine online with Nespresso® to activate your warranty and join the Nespresso® Club for exclusive, member-only perks. You’ll never have to wait long for that first cup of aromatic coffee in the morning with this machine’s fast heat-up time. Once you’ve selected your coffee, it takes just 30 seconds to heat the water to the perfect temperature. This makes creating incredible luxury beverages at home as fast as it is effortless. Thanks to the Automatic power off Function you’ll never have to worry about accidentally leaving your coffee machine switched on. After 9 minutes of inactivity, this machine automatically switches off - saving you energy and ensuring safety in your home. This is great if you’re running late for work and forget to manually switch it off before leaving the house. Whether you prefer short espressos or long coffees, you can effortlessly create both types with this model’s programmable coffee size feature. With a simple touch of a button, you can prepare either a 40ml espresso or a 110ml lungo coffee with complete ease. This makes the machine really versatile for sampling various blends and different styles of coffee. When you register your new coffee machine online with Nespresso®, you’ll activate your warranty and gain instant access to the Nespresso® Club. This is an elite, members-only area that provides exclusive perks and a host of personalised services, including ordering and customer care. Just make sure you register after purchase to benefit from everything the Nespresso® Club has to offer. Bought this for my husband for his birthday and he’s really pleased with it. Nice and compact and can be used with the Aldi pods too! This machine is beautifully compact to fit on a work surface; makes lovely coffee consistently every time and very quickly with very little cleaning up afterwards and looks good. What more do you want from a coffee machine? I was looking for a replacement for our tassimo machine that sprung a leak and saw this Nesspresso machine. Was impressed with the quality and it makes a great cup of coffee. It was even more of a bargain as it came with 150 free coffee pods, so in effect it was less than half price. Well worth considering if you want a coffee machine for the odd cup now and again.